Standing roughly five feet tall, Nanay Maria De Vera Campanero’s petite frame belies the greatness of her wisdom as an entrepreneur and depth of her commitment to her mask making business. 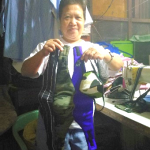 The 57 year old wife of Tatay Lucio, who works as a security guard for a tire company in Santolan, and mother of two did not hesitate to share the reason why she put up her mask business. Nanay Maria Campanero in her work table, with her Juki high speed industrial sewing machine and stack of masks ready to be sewn. It was around May 2014 when she started her face mask making business. When she is not busy with her Avon and Natasha direct selling business, she would spend time with her neighbor, a professional seamstress who also sews face masks. 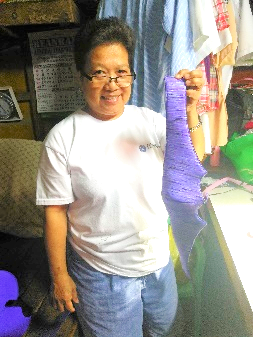 She would observe her work and eventually ended up making her first product: a round rag. 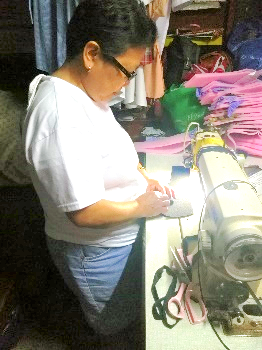 In exchange for borrowing her neighbor’s sewing machine to sew her round rags, Nanay Maria would help her neighbor trim her sewn products. Nanay Maria would then sell her round rags to shops around Antipolo. 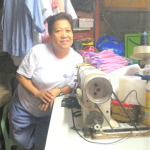 Their mutually beneficial relationship and her careful observation of her seamstress neighbor’s work went on for months, until Nanay Maria felt confident enough about her own sewing capabilities. She bought her Juki high speed industrial sewing machine in August 2015, paying for it in weekly installments. 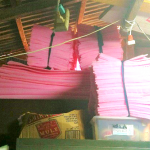 Her initial investment of Php 500 for the face mask cloth, which eventually increased to Php 1,000 including the foam and straps, proved to be a worthwhile risk. It wasn’t long before orders for her face masks kept coming, and she now has regular buyers. Nanay Maria shows her attractive cloth face masks that protect commuters and cyclists from inhaling the smoke and fumes of motor vehicles, in style. 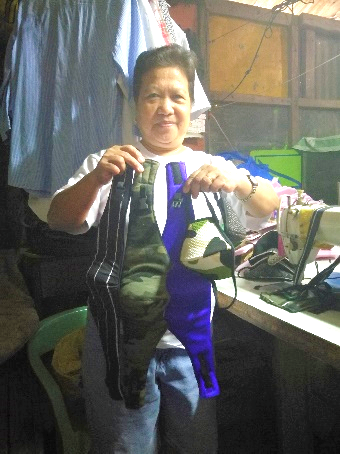 The transition from sewing round rags to face masks – the weapon of choice of commuters and cyclists against the harmful effects of pollution – came natural for Nanay Maria, considering that she has already learned how to make them just by carefully observing her neighbor. When Nanay Maria already had her sewing machine, she asked her neighbor for some reject fabric, which she successfully sewn into her first face mask. Upon seeing her finished mask, her neighbor said, “O kaya mo na!”, prompting Nanay Maria to invest in more raw materials for her face mask products. Nanay Maria’s decision to establish a mask making business seems to have been written in the stars. She left her hometown of Bautista, Pangasinan to study at Araullo High School in Manila for her sophomore year, where she took up tailoring as her elective. “Nakabuo po ako ng pantalon nun, as in buong pantalon po talaga,” she shares, beaming with pride. 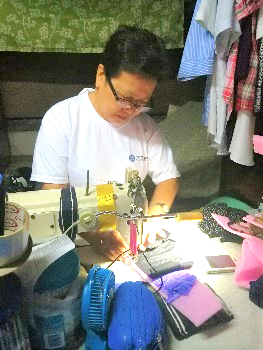 “Mahilig po talaga ako magtahi.” Even after she went back to her province where she finished high school, her love for sewing remained. 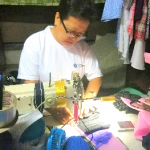 She shared that before she married Tatay Lucio, she already owned a Singer sewing machine, but was forced to sell it to make space for her Juki sewing machine. 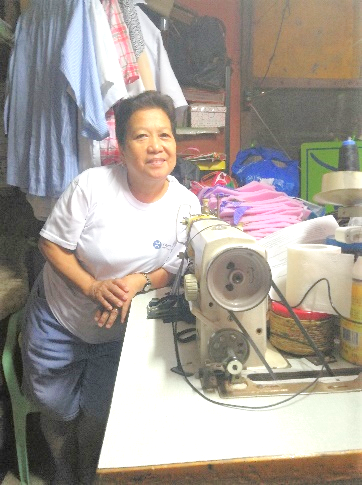 Nanay Maria is a Commerce-degree holder from the Jose Rizal College who has always loved sewing. After completing her high school education, Nanay Maria returned to Manila, where she worked as a canteen employee in PNP Fort Bonifacio, Taguig. Her employer noticed she spent a lot of time reading, and asked if she wanted to study again, which she answered affirmatively. Her generous employer offered to shoulder half of her tuition fee, full transportation and allowance expenses, allowing Nanay Maria to study again at Jose Rizal College (now Jose Rizal University), where she earned a Commerce degree. After her college graduation, Nanay Maria worked with a bookkeeping company and National Book Store, serving as a Quality Control staff of the latter for seven years. 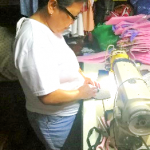 She went back to work as a Quality Control staff of a garments company in Tikling, Antipolo when their first born child was almost two years old. After moving in to their present residence in Antipolo in 1999, she made the decision to be a full-time Mom. Her sacrifice paid off. Two decades later, her children Reena Joy and Raymon are intelligent adults whose good upbringing contributed to their success. Reena Joy was a scholar all throughout her stay at the De La Salle University-College of Saint Benilde, where she graduated with an Export Management degree. Now 23 years old, she works as an Administration Officer of the call center company Alorica in Magallanes, while 20 year old Raymon is currently a BS Mathematics student from the Polytechnic University of the Philippines. 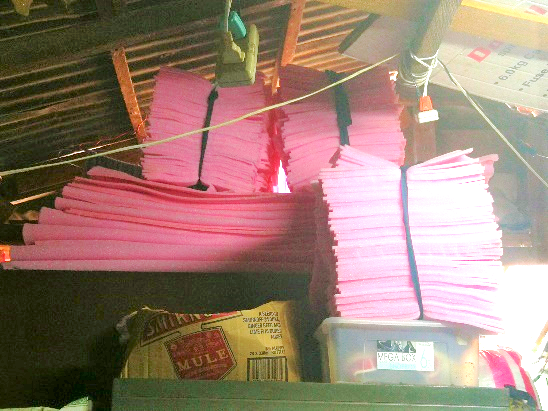 These stacks of pink foam, bought in Anonas by Nanay Maria's younger child Raymon, help give structure to her face masks. Of her two children, her son Raymon is the one who is more involved in her mask making business. He buys her foam from Anonas after his classes end, and sometimes accompanies her when she buys cloth and other sewing materials from Taytay. Her children’s success and her growing business are enough rewards for the solo entrepreneur, but the seeds of hope she sowed many years ago is just starting to bear fruit. To date, her mask making business has enabled her to invest in practical appliances and equipment, namely, a brand new Acer laptop which Raymon uses for his school assignments, a 32 inches wide LG TV and their cellphones. All these were borne out of hard work, fatigue, sweat and tears, particularly from the time when she encountered the greatest challenge to her mask making business. Just last year, the demand for her face masks plummeted because of unhealthy competition. One of her neighbors began sewing face masks but instead of matching her selling price with the usual rate, she lowered it further. The other buyers naturally bought from her because of her lower price, resulting in lower sales for Nanay Maria and the other face mask makers in her community whose masks are now considered expensive. Nanay Maria demonstrates how she makes her face mask. “May gumawa rin [ng face masks]. Kaya lang, nung siya na yung nagbenta sa Divisoria, binabaan niya yung presyo niya, pumayag siya na Php 13, Php 14 kada piraso, na ang talagang kuha ay nasa Php 15, Php 16. Nag-lie-low sa pagkuha sa amin yung buyer kasi yung pagbenta niya sa Divisoria, hindi na kinukuha kasi namamahalan na sa presyo. Pero, laban pa din,” Nanay Maria says with a determined look on her face. “Hindi siya magandang kakumpitensya. Importante ang kumpetisyon pero huwag mong patayin [ang iyong kakumpitensya],” she adds, expressing her stance about business competition. When asked how she overcame this obstacle, she shared it pushed her to sell her masks to the markets by herself. “Nasubukan ko na magtinda dun sa Baclaran, sa Divisoria. May katulong ako magbuhat, paminsan si Raymon, paminsan yung kapitbahay ko na nagtatahi din.” She shared she did this for two months, but the exhaustion brought by the hours-long commute from Antipolo to these markets, and back home, was too much. Her advice to aspiring and new entrepreneurs, highlights her commitment to her mask making business and values of diligence, persistence and drive for productivity. 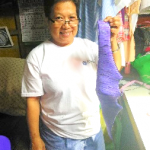 Nanay Maria proudly shows off her finished product. Nanay Maria’s mask making business is already turning four this year, but her inspiration remains the same. “Pamilya,” she simply says. She dreams of having an official bagsakan for her masks, and stores with heavy foot traffic like Baclaran and Divisoria in ten years. She also envisions a bigger production area with more sewing machines, an up-and-down house for her family and her own delivery vehicle. Her strategy to achieve these dreams are simple. With her level of commitment to her business and discipline as an entrepreneur, the seeds of hope she has been sowing for years are likely to blossom into her realized dreams in the near future.